Ladies & Gentlemen is a game about women buying clothes. If that sounds sexist, don’t worry: it isn’t. It’s important to know that, while in Ladies & Gentlemen competing teams are comprised of one Lady and one Gentleman, in the end it’s the ladies who do all the work and determine the winner. The Gentlemen have a role, of course, but their success in the game is based almost entirely on luck, involves little long-term strategy, and exists entirely to support the Ladies. Even if a Gentleman messes up doing his one job, it’s possible that his Lady – if she’s clever, strategic, and just a bit devious – can still pull off a victory in the end. Wait. Maybe the game is sexist. Just not in the way you think. Ladies & Gentlemen is a set-collection game for 2 to 5 teams of two players each. Teams compete over six rounds of three phases each, with each phase involving actions performed simultaneously by the Gentlemen’s side and the Ladies’ side. Over the course of the game, the Ladies will collect cards representing various items of clothing as well as one or more Servants, each with their own victory point scores as well as end-game scoring bonuses. Meanwhile, the Gentlemen will participate in a tile-flipping game to collect resources and sell them for cash that is used to purchase their Lady’s cards at the end of each round. At the end of the sixth round, victory points – here called Elegance points – are calculated (with extra cash on hand useless except in the case of a tie) and the most elegant Lady at the ball is declared. Before the start of the game, the play area is set up with a Ladies side and a Gentlemen side, with team members facing each other across the table. Each team is separated by a cardboard storefront placed on a plastic stand, one storefront for each team. Facing the Gentlemen, the storefront displays an industrial building of some kind; facing the Ladies, a boutique shop. Each storefront is designed in one of five primary colors, and the Lady will collect a set of carboard tokens and a wooden meeple matching the color of the shop in front of her – the tokens are used during the game to identify where the Lady intends on shopping on each of her turns, while the meeple identifies which shop is the Lady’s favorite. The Ladies will sort and shuffle three decks of Wardrobe cards and a deck of Servant cards. Then each Lady takes a number of Artisan cards equal to the number of Ladies in the game. These cards will be used each round to determine the number of Wardrobe or Servant cards the Ladies will draw for each store. Finally, each Lady draws a Servant card, which she keeps hidden from both her Gentlemen and the other Ladies. Meanwhile, the Gentlemen will shuffle and deal a Contract card in front of each of their storefronts. Contract cards represent groups of resources that can be cashed in for special financial and victory point rewards. The Gentlemen will also draw a Current Market card from a deck, placing one face-up near the play area and discarding the rest. The Current Market card sets the price for individual resources that will be sold during each game round. The Gentlemen then take five random Resource tokens for each player and shuffle them face-down in their play area. They will also take three Number tokens – numbered 1 through 5 – and mix them face-down with the resource tokens. Finally, the Gentlemen each receive $500 cash and a free resource token worth $100 according to the current market card, chosen randomly from the remaining stock. Play is ready to begin. Over the course of the game, players may interact with each other and with other teams with certain limitations: Ladies may not reveal to their Gentlemen their Servant cards, and Gentlemen may not reveal precisely how much money they have. Innuendo and clue-giving is encouraged if done so in-character. This is where the roleplaying aspect of the game comes in: team members must communicate to each other – Ladies, about their general set-collection strategy; Gentlemen, about their financial limitations (or lack thereof) – without giving precise details. In addition, Ladies interact with each other to misdirect the other Ladies in regards to their own strategy (generally based on the bonuses provided through the Servant card), or to suss out the strategy of their rivals. Each of the six game rounds consists of three phases: morning, afternoon, and evening. At the end of the sixth round is the Ball and end-game scoring occurs. The goal of each team is to have the highest number of Elegance points at the Ball. The vast majority of the Elegance points come from the Ladies Wardrobe cards, with special bonuses coming from her Servant(s), though in some cases a fulfilled Contract from the Gentlemen may add additional points to the final score. To score, a Lady must have a Dress – if she arrives at the end-game without one, she loses her Servant card. 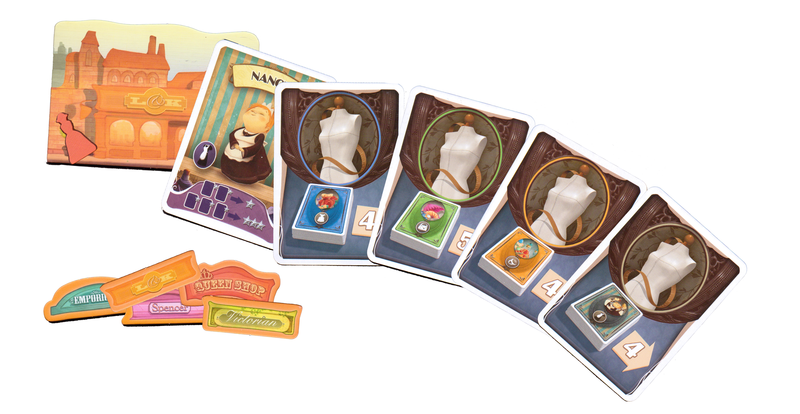 In addition, most – but not all – of the Wardrobe cards belong to one or two of the three designers; at end-game, a Lady can have no more than two designers in her wardrobe. Finally, she can have no more than one item in each category – dress, coat, hat, gloves, etc. Cards that duplicate categories or don’t meet the designer requirement are discarded before scoring begins. Each game phase happens simultaneously for the Ladies and Gentlemen. At the start of the Morning phase, the Ladies will select what each shop has for sale. Each Lady will select one of her Artisan cards to place, face down, in front of her favorite boutique – the boutique that matches her color. Each Artisan card will identify both a card category (jewelry, accessories, and clothes, or servant) and a number. After all cards have been placed, the Ladies each turn their Artisan cards over and draw a from the appropriate deck a number of cards matching the number of the revealed Artisan card. She will choose one card to reveal, placing it face-up on top of the selected cards, and placing those cards back in front of her favorite shop. Each shop should now have a small pile of cards in front of it with either a Wardrobe or Servant card visible. Ladies leave the Artisan card they played at the beginning of the round in front of the shop – these will be returned back to the Ladies’ hands in later rounds. At the end of the round, each Lady will choose a Visit marker – a token representing each of the available shops – for the store she wishes to purchase from and hides it in front of her. This ends the Ladies’ actions. Meanwhile, the Gentlemen need to collect tokens from the stock exchange. At the start of a signal given by one of the Gentlemen, each player will begin flipping over resource tokens. Their goal is to collect three Resources and a Number token. The Resources will be sold during the next round to fulfill contracts and earn money, and the Number tokens will determine turn order for both Gentlemen and their Ladies. Turn order can be crucial both for getting to a contract before another player, as well as for the Ladies being able to get to certain items from the store of their choice before their rivals can buy it out from under them. All the Gentlemen will flip over tokens simultaneously with one hand. When a token is revealed they can choose to keep it – placing it face-down in front of them – or leave it face-down in the stock. Once a Gentleman places a token in front of him he may not return it to the stock, and once he finds and chooses to keep a Number token he must stop searching for other resources immediately, even if he has not met his maximum of three. This means a Gentleman may sometimes sacrifice resource collection in order to assure an early turn order – possibly at the recommendation of his Lady if there is a certain item she has her eye on that a rival may also be seeking. Once each Gentleman has a Number token, the phase ends. At the start of the next phase, the Afternoon, the Ladies reveal their Visit markers and take the cards from in front of their selected boutique. If two Ladies have selected the same boutique, the Lady whose Gentleman has the lowest turn order goes first. She will select one card and pass the deck to the next lady visiting the same store, in turn order. That Lady then passes the cards to the next Lady visiting the same store, or back to the first Lady, who may then select another card from the pile and pass it on again. Play continues like this until there are no cards left or the Ladies do not wish to select from the remaining cards. If a Lady is the only player to visit a particular boutique, she may select as many cards from that boutique as she wishes. Cards not chosen during this round are placed at the bottom of their respective decks. If a Lady’s favorite boutique – the one matching her player color – is not visited by any players this phase take note: the revealed card may be purchased by that Lady at a discount during the next phase of the round. As the Ladies are selecting their cards, the Gentlemen cash in their resource tokens. They can do this by either cashing in the tokens for cash based on the values stipulated by the Current Market card, or they may cash in sets of tokens that match one of the Contract cards displayed at a storefront. In the latter case, the first Gentleman to fulfill a contract will receive a bonus of some sort – usually a financial premium, but sometimes the bonus will include an Elegance points option. At the end of this phase, the first Gentleman to fulfill a contract will claim the card for the end-game bonus; until then, each other Gentleman may also use his collected Resource tokens to fulfill the contract, though he will not receive the premium. As Resource tokens are cashed in, they are returned to the box. Gentlemen are not required to cash in all their tokens this round – any tokens not used are kept for the next round. The final phase of the game, evening, is where purchases are made. Each Lady will pass to her Gentleman the cards she selected in the previous round. A Gentleman now have three options for each card: he may purchase it, paying the listed cost and passing the card back to their Ladies; he may refuse it, placing the card at the bottom of its respective deck; or, he may defer purchase, paying $100 to pass the card back to his Lady. She will hold on to it until the next day when she will have the opportunity to present it for purchase again. In addition, if a Lady’s favorite boutique received no visitors, the revealed card may be purchased for half the listed price. During this phase, roleplaying can be important (and at its most fun) as Gentlemen try to allude to why they may or may not pay for certain cards, while the Ladies hint at why certain cards might be vitally important to purchase. At the end of this phase, each Lady reclaims her Visit markers and passes her hand of Artisan cards to the Lady on her right. At the end of the third turn, each Lady should have been passed only one card; at this point, she will also claim the Artisan cards from in front of her favorite Boutique to replenish her hand. The Gentlemen will return their Number tokens to the stock and replenish the stock so that there are again 5 resource tokens per player (note that the rulebook has an apparent conflict here; see my comments in the Impressions section of this review for more details on this). Contracts that were honored this turn are returned to the bottom of the deck or claimed by a Gentlemen, if appropriate, and replaced by a new Contract from the deck. Contracts that were not honored will receive a $100 banknote, which can be claimed if that contract is fulfilled in the future. Play the moves to the next turn; or, if this is the end of the sixth round, scoring occurs and the most elegant Lady at the ball is announced. I first played this game with six players: two women, four men, and two couples. When it came time to choose roles, the choices were obvious: the women became Gentlemen, the men became Ladies, and the couples were thus split up. If it gives you any idea how much fun the game is, simply settling into our new gender-swapped roles involved so much laughter that it took a while to get through explaining the rules of the game. It only got better from there. The components are pretty basic. There are several decks of cards sporting lush, cartoonish artwork representing the various clothing items the Ladies are competing for. The various cardboard bits are solid and brightly colored. The game uses paper money, which I am not a fan of, but there’s relatively little handling of the money throughout the game, which should extend its life. On the whole, the game oozes candy-colored fun, which is in keeping with its overall theme. That said, the price range of $26 to $32 seems a little high. This feels more like a $20 to $25 game, though with a lower range of $26 that’s quibbling. I found the rulebook a bit difficult to manage. In a handful of places, rules seemed to contradict each other. For example, during the set-up the rulebook says to select and mix up 5 resource tokens per gentleman to make up the stock. Remaining tokens are placed in the box – a phrase that has always meant, in every other game I’ve played, that they are removed from the game. During a later phase in the game, Gentlemen will cash in their tokens to fulfill contracts and make money – here, the rulebook also says to discard the resource tokens to the box. Yet, during the end turn phase the rules state to make sure that there are five tokens per Gentlemen, and that if there are no more tokens to put in the stock, players are to “mix in those that were put to one side.” Does that mean to pull tokens that were discarded into the box? Then why not say that, or rather than telling players to discard into the box, tell them to form a “supply” pile? I think this may just be a matter of defining terms, but it left us wondering if we were playing right. In terms of variability, there is not much going on here. Other than the the randomness of the clothing cards that come out over the course of the game, its going to play pretty much the same way each time. The variability comes from the interaction among players and the dynamics of each team. The roleplaying element of the game adds a little bit of variability as well – an ambitious player might flesh out their “character” for each game and indulge that role – but this is entirely dependent on your play style and not something built into the mechanics of the game. Because I’m a family man, I like to consider a game’s appropriateness for children. Ladies and Gentlemen is a tough one. Despite its irreverence and florid art style, the game still pivots on exploring and exploding gender roles. Even with as light a touch as the game has here, it may be too subtle for younger kids to grasp. That said, the basic set-collection and tile-flipping mechanic is straightforward and accessible, and this could probably work as a family game – I just think it may lose a little of the bite that makes it fun to play. However, since it is a team game, Ladies and Gentlemen may shine with actual couples – I think our Pegs might all get a kick out of it, and I can already envision Robb struggling to find the perfect hat to go with that designer dress he just snagged on sale. Ladies & Gentlemen straddles the line between party game and gamer-game. The play is fast and fun, and the roleplaying element encourages a ton of player interaction, mostly good-natured trash talking among the ladies. At the same time, the set collection task undertaken by the ladies is a bit more involved – both within a single round as well as over the course of the game – than the average party-game player might be prepared for, even though a veteran gamer might find it simplistic and a bit tedious. The roleplaying element is fun, but it also serves a strategic purpose, as bluffing and distracting your opponents are key parts of the gameplay. I’d say this is the kind of game you break out at the end of a long day of gaming, or perhaps as a palate cleanser between heavier games. The fact that it can play so many people is a benefit – particularly in my game group, where we occasionally have large enough crowds to necessitate splitting into smaller groups, Ladies & Gentlemencan be a way to pull everyone back together again briefly. I’d put this in the category of Masters of Commerce (aka Panic on Wallstreet) – probably not a game you you gather specifically to play, but a nice one to have on hand. The game is also pretty compact – both in terms of what you get in the box as well as the table space needed to play it – which makes it something you could take on the road easily. Ladies and Gentlemen is a lush, light, and laughter-inducing game that would be a great way to start or end a long day of gaming. It involves a fair bit of light roleplaying, so shy players beware, but if – like me – narrative games are a big part of your collection, this is one to consider. Immediately after the end of one play of the game, one of the Gentlemen players, Craig, turned to us, the Ladies, and said, “I had no idea what you were doing over there.” This seemed thematically appropriate. Do not underestimate how quickly you will fall into stereotypically period gender rolls. Early in the game, I noticed that one of my rival Ladies had bought a dress that without the imprint of one of the game’s three designers. “Look at her,” I said to the other Lady. “She probably bought that one right off the rack. She’ll never be able to show her face at the ball in that.” This statement fell horrifyingly naturally from my lips. Of course, despite my cattiness, her (his) team won. As is the case with some set collection games, there is a decent amount of luck involved in Ladies and Gentleman. I played a fairly strategic game – carefully maximizing sets of designers and the bonus points from extra servants – and yet still lost to a team who seemed to play more randomly. For some players, this could be frustrating, though the game is light enough and entertaining enough that having a carefully crafted strategy exploded doesn’t hurt that bad. The challenge of the game is supposed to be the demands of the Ladies conflicting with the limited resources of the Gentlemen. Yet, I found that the Ladies didn’t really have an issue buying the items they wanted, which contributed to victory being more a matter of the luck of the draw. However, I earlier mentioned the confusion we faced regarding how resource tokens are managed, and I have a feeling we missed something there – the game feels like resource tokens should become more scarce in same way, making it harder to earn money over the course of the game. If that’s not the case, it may just be that we got lucky, but I’m skeptical. Ladies and Gentlemen may have some of the best packaging I’ve seen in a game. Rather than a flimsy plastic insert that mainly takes up space, it has compartments made up of thick cardboard walls that are decorated in an art style consistent with the game. The box uses space efficiently and the snug fit of the lid keeps the various tokens and cards from getting rattled ans shuffled around without the need for bags. This was a nice little bonus.